Invisalign® is an advanced orthodontic technique that can discreetly straighten your teeth without the discomfort associated with traditional metal braces. The Invisalign® system uses a series of clear, removable teeth aligners that gradually straighten your teeth to the desired position. Our Morristown cosmetic dentists will create a customized Invisalign® treatment plan for you to help you achieve the beautiful smile you deserve. 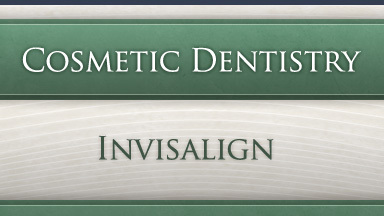 Following an oral examination, our dentists will be able to determine if you are a candidate for Invisalign®. Our team will then take digital impressions of your teeth, which will then be used to create a set of custom-designed clear teeth aligners to use over the treatment period. After you have worn the first set of aligners for about two weeks, you will replace them with the next set. Each aligner is slightly different than the previous, which enables Invisalign technology to gradually move your teeth to the desired position. The Invisalign® process typically takes about 7 to 15 months to complete, depending on the starting position of your teeth. Invisalign® aligners should be worn consistently throughout the day, but can be removed for eating, drinking, brushing and flossing. For more information on straightening your teeth without traditional braces, please contact our practice today to schedule an Invisalign® consultation.